The Miche Hope (argyle) for Demi Bags is a little bit preppy and a whole lot of peppy! Faith, Hope, Love, Courage and Joy in an eye-catching crossword design take center stage and set the tone for this lovely addition to the Hope line. Smooth pure white faux leather is complemented by contrasting eggplant and blue lettering and rich grape details. 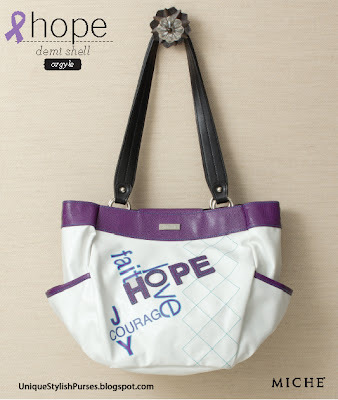 The letters in the word “Hope” feature appliquéd faux leather. Contrasting blue stitching is fresh and young! End pockets. Remember, Hope lives! A portion of the proceeds of every purchase of a Hope Shell goes directly to cancer research. See all Miche Hope Shells available. So if you want this Hope Shell don't wait, order now before it's too late!